Interest Income (Form 1099-INT) - What is it? Do you need it? By now there is most likely a tax form tower sitting on the desk, or probably just thrown on your kitchen counter - forms from banks, lenders, employers, stockbrokers, and many others. For some people, the forms will just be handed over to your tax preparer; for others, you will take the information from the forms and input it into your favorite tax software - perhaps even uttering a few four-letter words as you go. Regardless of how you intend to complete your taxes, you probably don’t know all the details about what the many letters, numbers, and other data printed on the forms mean. This is one of several posts that will change that, and help you start to understand the multitude of tax forms. Had signature authority or financial interest in financial account(s) (foreign), or were a transferor to a foreign trust, a grantor of a foreign trust, or received distributions from foreign trust(s). Note that FATCA requirements might apply. 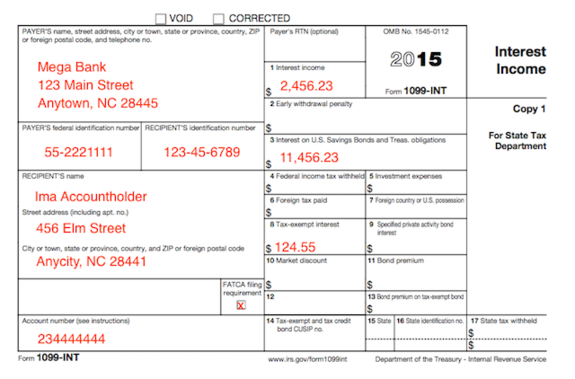 A typical Form 1099-INT looks like the example below. The identifying information of the payer is in the upper left of the form. Your information is under that in the bottom left of Form 1099-INT. Your information (name and address) is included. Either your full Social Security Number, or perhaps only the final few digits (for security purposes) will be included in the form. Showing only the last couple digits of a Social Security Number on certain forms is a fairly new development. Regardless of whether or not your copy of the form has your full Social Security Number displayed, the entire number will be reported on the version sent to the IRS. Quite frequently, your account number with the institution is optional for tax forms. However, if you hold more than one account with the same payor (who will be sending more than a single Form 1099-INT), the number is required. As in the above example, if the “FATCA filing requirement” checkbox is marked, account numbers are also required to be on the form. If the data on the Form 1099-INT is required to comply with the Foreign Account Tax Compliance Act (FATCA), the “FATCA filing requirement” box will be checked. So, if you see that the box has been checked, you might have reporting requirements due to FATCA, including the possibility that you have to file a Report of Foreign Bank and Financial Accounts (FBAR). Ignore the check in this box at your own peril - the consequences of making mistakes in regards to FATCA and FBAR can be very serious. Box 1 shows any taxable interest that has not been included in the Box 3 amount. This box contains amounts USD 10 or greater that have been credited or paid by savings & loans, mutual savings banks that do not have capital stock in the form of shares, cooperative banks, building & loan associations, credit unions, homestead associations, or similar entities. It is important to note that any amounts in Box 1 are correctly considered interest, even though they might be called dividends. This box includes amounts due to interest from bank deposits, dividends from life insurance companies, debts (such as debentures, bonds, notes, and non-United States Treasury certificates) issued either as registered, or that are a type that is offered publicly, or any amounts that had foreign or federal income taxes withheld. Any interest of USD 10 or greater from a real estate mortgage investment conduit (REMIC), a TIH of a WHFIT, a financial asset securitization investment trust (FASIT) interest holder, and interest paid to holders of collateralized debt obligations (CDO) will be reported in Box 1 as well. Other items included in Box 1 are accrued qualified interest from bonds sold on a date of payment or between interest dates, OID from short-term obligations (less than or equal to 1 year), and interest from certificates of deposit. There will also be interest of USD 600 or greater, which includes interest on death benefits from life insurance, interest obtained with damages, any interest paid on a refund of income taxes (whether federal or state), and interest from nonperiodic payments from certain notional principal contracts. Lastly, any non-cash gifts received from a financial institution (such as those for opening a new account), are considered interest and will be included as well. Box 2 is simply any amount that was forfeited due to early withdrawal from an account such as a CD (certificate of deposit). This amount may be deductible. Any interest earned from Treasury Bills, Treasury Bonds, Treasury Notes, Treasury Bills, and United States Savings Bonds is in the Box 3 amount. The amount in Box 3 should not be in the Box 1 amount as well. This amount is usually taxable from a federal perspective, and exempt for state or local tax purposes. Backup withholding is in Box 4. There will usually be an entry in Box 4 if a correct taxpayer identification number (TIN) was not provided, or no TIN was provided at all to the entity issuing the form. You will need to report this as a tax withheld on your tax return. Box 5 shows your portion of the investment expenses in a single class REMIC. This amount will also be included in the amount in Box 1. These expenses may be deductible (the usual 2% limit applies) on Schedule A. Box 6 includes foreign tax that was paid on any interest. This might be deductible, or you might be eligible for a credit on your taxes. The US possession or foreign country that taxed the interest is named in Box 7. Interest that is tax-exempt that was paid is included in the Box 8 amount. This amount is entered on Form 1040 in line 8b. Exempt-interest dividends received from mutual funds or RICs are on Form 1099-DIV (see the entry on Form 1099-DIV later in this series). Interest of USD 10 or greater from certain private activity bonds is reported in Box 9. This amount is usually taxable. Box 10 includes any market discount accrued over the year if you elected under the provisions of section 1278(b) for market discount to be included in income. You will see any premium amortization that is allocable to interest payments for taxable covered securities in Box 11. The exception is if the payer was notified in writing about the fact that you do not want them to amortize any bond premiums under the provisions of section 171. An amount reported in Box 11 means it will be necessary to use Schedule B, Part I. If there is not an amount reported in Box 11 for taxable covered securities that were purchased for a premium price, the interest will be reported in either the Box 1 amount or Box 3, depending on which is the applicable box. Box 12 is not used for the majority of taxpayers. Box 13 includes any premium amortization that is allocable to interest payments for tax-exempt covered securities (taxable securities will have been included in the Box 11 amount). If there is not an amount reported in Box 13 for tax-exempt covered securities that were purchased for a premium price, the interest will be reported in either the Box 8 amount or Box 9, depending on which is applicable. When the interest that was paid on a tax-exempt covered security is less than the amount in Box 13, the difference is considered a loss (nondeductible). CUSIP numbers are assigned to identify municipal bonds and other securities. Box 14 is the CUSIP (Committee on Uniform Security Identification Procedures) number for the tax-exempt bonds, or tax credit bonds, where tax credits were permitted or which paid taxable interest. This box will be blank if a CUSIP number wasn’t assigned to the bonds. Information on state taxes withheld will be included in Box 15, Box 16, and Box 17. Finally, it is important to note that even if a Form 1099-INT is not received, you are still required to include interest income in your income tax return filing.